Guelph, Ontario | October 1, 2018 – Today is International Day of Older Persons, a day declared by the United Nations to recognize and celebrate the nearly 700 million people worldwide over the age of 60. It has been predicted that by 2050, over 20% of the world’s population will be 60 or older. This booming demographic demonstrates the demand for new, innovative technologies that will assist older individuals in their later years with daily tasks, engagement, safety and more. CEO of AceAge, Spencer Waugh, was inspired to develop their automated medication delivery appliance Karie after seeing his own grandfather be admitted to the hospital eight times in one year due to medication mix-ups, an all-too-common but preventable result of seniors tasked with managing their medication regimens at home. Managing dosages can be complicated, often leading to human error, non-adherence, and poor health outcomes. AceAge recognizes the importance of secure medication storage and delivery. This is why they created a home health appliance that offers several security features including face recognition, pin code access, cartridge mismatch notifications, 72 hour battery backup and early dose prevention. Available later this fall, Karie’s early dose prevention features include the ability to bolt the device to your countertop, lock in the cartridge and disable early dispensing. 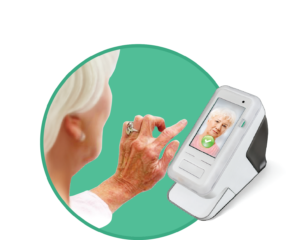 AceAge Inc. is a healthcare technology company, creating intuitive products to ease the aging process and improve health outcomes. Its upcoming product Karie is a home health appliance designed to help people take their medication safely, as directed by their physician. In addition to the release of Karie in 2018, AceAge has been working on various other upcoming initiatives, including i2P2 Studies. Any questions relating to AceAge’s handling of personal information should be directed to our Privacy Officer. AceAge's products organize, schedule, and deliver pills to ensure that individuals take their medication at the right time through the use of (amongst other things) a medication delivery device, a mobile app companion to that device and our website (the "Services"). AceAge’s Services are used by individuals ("users") who decide to operate an AceAge product. AceAge is required to collect and use personal information in order to provide its Services, to provide product information, to open, maintain and process credit card transactions, to administer and process customer surveys, special promotions and other marketing activities, as well as other internal administrative functions. As a result, personal information can be collected when you use the Services. This can include your name, age, address, the medications which you have been prescribed, when you are required to take medication and when you actually take them, medical conditions which you may have, billing information and credit card information. If you use AceAge's website (the "Website"), your IP address, your computer's operating system, the browser type and language are automatically collected each time you use the Website. Moreover, the identity of the website you came from will also be collected, as will your web request and the date and time of your visit and the site pages visited. Other information such as your name, address, and e-mail address ("contact information") is collected in order to allow us to administer the Website, to identify and contact users and in order to conduct Website maintenance. For audit and other internal and administrative purposes AceAge may also keep a record of all information you contribute to the Website. AceAge does not rent or sell personal information to other companies or individuals. We may share aggregated non-identified information with other companies. AceAge may also use your personal information on an aggregated, non-identifiable basis for research and development purposes. AceAge, unless required or permitted by law, does not collect, use or disclose personal information, except when it has obtained consent. In all cases, AceAge limits the amount and type of information collected to that which is necessary to meet the purposes described above. AceAge undertakes to keep all personal information it collects strictly confidential. AceAge will only retain personal information for the duration of its intended use or as otherwise required by law. Thereafter, all personal information that does not have a specific purpose or that no longer fulfills its intended purpose will be destroyed in a secure fashion. AceAge respects individual's privacy and will protect that privacy as vigorously as possible. AceAge stores personal information in electronic and physical files that are secure and to which access is restricted. AceAge also makes every effort to keep all personal information it holds, including contact information and financial information, accurate, complete, and current. AceAge will update any changes to personal information when received from you through the Website. If AceAge holds personal information about an individual which can be established by the individual to be inaccurate, AceAge will take reasonable steps to correct it. If AceAge requires personal information for a new purpose, it will seek consent for such new use. You have the ability to access all your personal information on the Website at any time. If you have any questions regarding the personal information held by AceAge, you should, in writing, contact AceAge's Privacy Officer. AceAge will respond to any written requests within 30 days of receiving written notice. AceAge will keep records of enquiries and/or objections and will document their resolution. AceAge will conduct all investigations in a timely, fair and impartial manner.